Ellipses are an important geometric shape for furniture, the obvious examples being table tops, mirror frames, etc. Partial ellipses can also be used in chair frames, table legs, bed heads and so on. 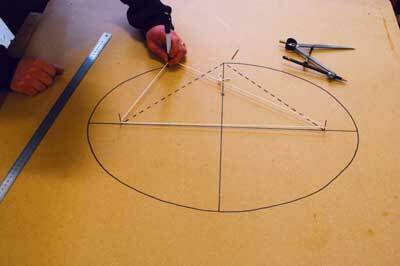 The ability to draw ellipses also comes in handy for making perspective drawings of circular pieces. 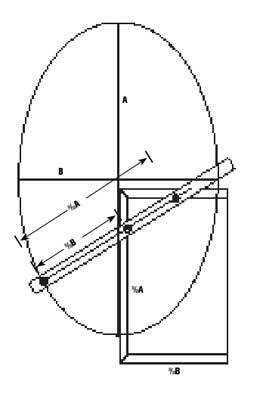 Ellipses differ from circles in that instead of having a single focus at the centre they have a pair of foci, the sum of the distances to both foci remains constant around the circumference of the ellipse and is always equal in length to the major axis. An easier way to visualise this, and also the most practical way to physically construct one in the workshop, is the string method so we will begin with that. First lay out the major axis (A) of the ellipse and then the minor axis (B) perpendicular to it. Take half the length of the major axis and draw an arc from one of the ends of the minor axis through the major axis at either end - these are the foci of the ellipse. Drive two pins into the board to create the foci and another temporary one at one end of the minor axis. Tie a loop of string around the three pins and then remove the temporary one. Now run a pencil around the inside of the string loop keeping it taut at all times. Voila! If you don't want pin holes in your finished piece, you can use this method to create an MDF template and then rout around it with a bearing guided bit. 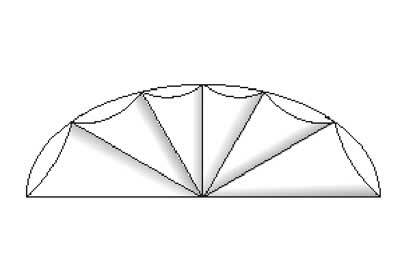 This one may ring some bells from your school days and is still the most widely accepted method for constructing an ellipse on paper. It is also a useful revision of some of the divider techniques we covered in issue 200 of F&C. Begin by drawing two concentric circles, one equal in diameter to the major axis (A) and one equal to the minor axis (B). Step off around the circle to create six equal divisions and then bisect one of the divisions without adjusting the dividers and step off again to divide the circle into 12. 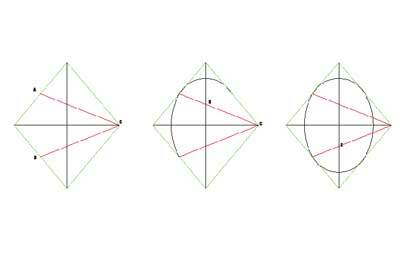 Draw a horizontal line inwards from each point on the outer circle (1). 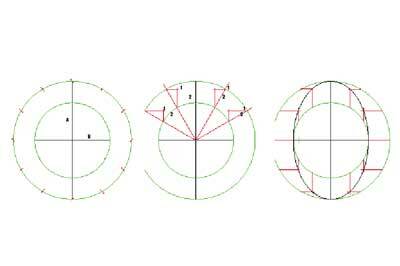 Then draw a vertical line outwards from each point on the smaller circle (2) to intersect with the horizontals. 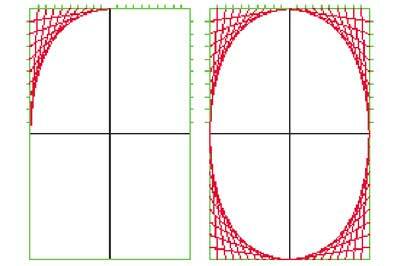 The intersections of these lines can be connected by a freehand curve to form the ellipse. When drawing freehand curves you get a much better result if you keep your hand in one position and move the paper around so that your wrist is always pivoting naturally. It's the same principle as positioning a workpiece so that your saw cuts are always vertical â€“ move the work around your body, not the other way around. If you are veneering an elliptical object, it is useful to be able to construct tangents and normals to them. Normals are at 90° to any given point on the ellipse and unlike a circle do not originate from the centre, they are constructed by bisecting the angle between the lines from any given point to each focus. Raising a perpendicular to the normal at the edge of the ellipse gives a tangent in exactly the same way as we would with a circle. If dividing an ellipse into segments, for example to produce a tromp l'oeil fan with sand shaded veneers, using the concentric circles method to position the divisions will produce a much more attractive array â€“ bottom â€“ than simply taking multiples of the same angle â€“ top. The rectangle method is similar in some respects to the concentric circles method, although it doesn't produce such an aesthetically pleasing series of points. 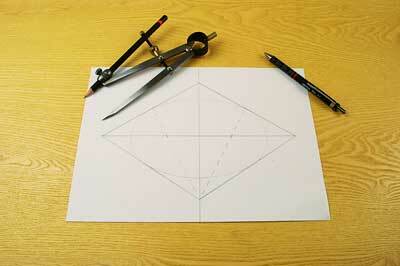 First, divide the long centreline and sides of the rectangle into an equal number of parts. Number the points on the ends inwards from top and bottom and the centreline outwards from the centre. Then draw straight lines originating from the top centre (X) and bottom centre (Y) through all points. The intersections of lines 1 and 1, 2 and 2, 3 and 3, etc. all fall on the ellipse and the line connecting them can be drawn in freehand. 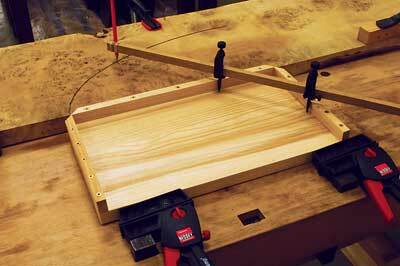 Another practical technique is the trammel method. Make a rectangular board edged with batten on three sides so that the long side equals half of the major axis (A) and the two short sides each equal half of the minor axis (B) â€“ measuring from the inside of the batten. Set up a beam compass with a pencil hole through one end. The distance from the pencil to the first trammel point should equal half of the minor axis and to the second one, half of the major axis. Now carefully slide the trammels along the battens and allow the pencil to describe one quarter of the ellipse, taking care to keep both of the trammels in contact at all times. If you need a smaller concentric ellipse you can pack out the insides of the battens, adjust the trammel positions and repeat the process. Both of the above methods are good practical ways to lay out ellipses on wood, but for drawing we need something a little more compact. The methods covered so far will produce a true geometric ellipse. 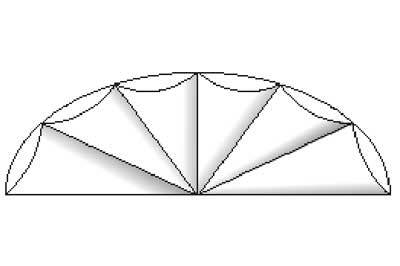 The rhombus method is a quick way of producing an approximate ellipse, albeit with slightly rounder ends. This method can be useful when sketching circles in perspective, or in circumstances where a slightly less pointed shape than a true ellipse is desired. 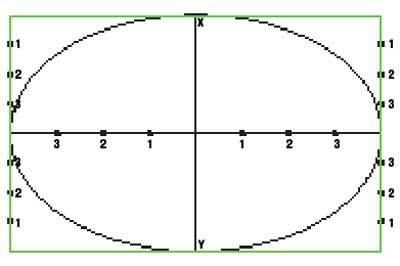 Begin by drawing a rhombus with sides equal to the diameter of the circle on which the ellipse is based. Draw in the centrelines horizontal and vertical. 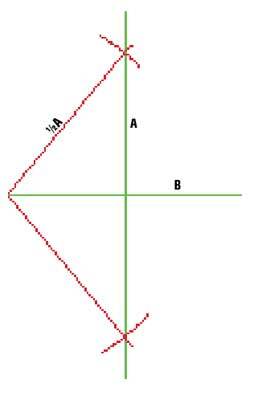 Bisect two lines of the rhombus (A and B) and draw lines from the opposite side through these points (AC and BC). 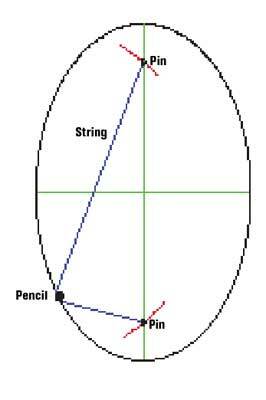 Now use your compasses to draw an arc about C connecting the two intersections and repeat on the opposite side to produce two sides of the ellipse. Fill in the ends with arcs drawn about points D and E where your connecting lines intersect the centreline. Another trip down memory lane; the straight line method is possibly the least taxing of all. Begin by constructing a rectangle of length equal to the major axis and side equal to the minor axis. Divide all of the sides of the rectangle into the same number of equal parts. This bit can be tricky with a rule and pencil but if you know how to enlarge or reduce using triangles then you should be able to use your dividers to subdivide the whole thing very accurately and with barely any calculations at all. If you can crack that, then you are beginning to think geometrically rather than numerically! 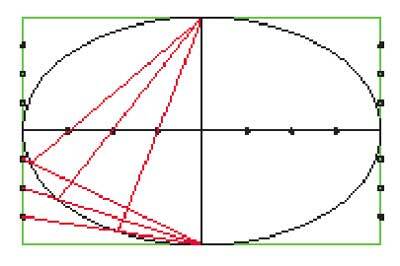 Taking each quarter of the ellipse in turn, draw a line connecting the top centre point to the first point down from top left, first left to second down, second to third and so on. 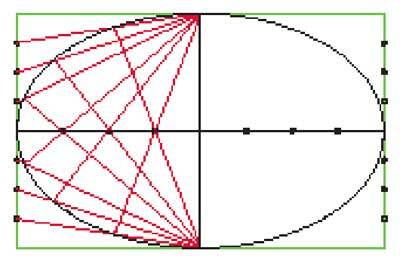 The ellipse will be formed from a tiny portion of each straight line, the more points you have, the closer you get to the true curved shape. It wouldn't be fair on people reading this article in isolation from the preceding ones in F&C 200 and 202, to finish without giving a solution on how to divide two different lengths into equal parts using geometry. Any equilateral triangle can be used to scale a dimension. 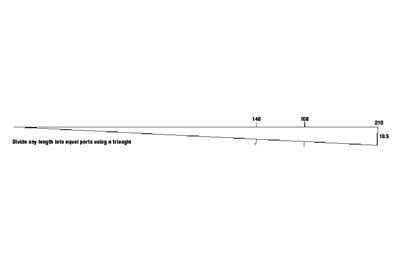 Taking the example in the straight line method, let's say you want the axes to be in proportion of 2:3 and the long axis to be 210mm â€“ the width of an A4 piece of paper. Draw a line 210mm long, and then set your dividers to a convenient subdivision of that length, say 10.5mm to give 20 divisions. Place one tip of the dividers on the end of the line and lay your rule between the opposite end of the line and the other tip of the dividers to draw an equilateral triangle â€“ if the other tip is on the 210mm mark on the rule the triangle will be equilateral. Using the rule, mark off 140mm â€“ two-thirds of 210mm â€“ on both lines. Whatever the dimension is between these points it will perfectly subdivide the short side into 20. If you change your mind and want a 4:5 ratio, measure 16.8mm â€“ four-fifths of 210mm â€“ up the triangle and there's your span to divide it into twentieths. Technological advances always bring limitations, and the necessity in modern society to be able to converse with computers has naturally brought arithmetic and algebra to the fore. For the craftsperson, however, the wonderfully tangible, elegantly simple and creatively flexible discipline of geometry remains as pertinent and applicable as ever. With a few simple instruments and techniques you can access a way of thinking that has served as a cornerstone of the crafts for thousands of years.